Japan is a great- perhaps THE greatest country for fireworks. The major HANABI (Japanese for fireworks) events, held mostly in the summer, are truly spectacular- impressive not only with their awesome power but also with their cutting-edge pyrotechnical artistry exhibited in the explosion of each finely crafted shell sent into the air. Despite the abundance of such HANABI festivals in the Kanto area (all easilly accessible from Tsukuba), including the presence of what many think to be Japan`s greatest fireworks competition just a few minutes away in the neighboring city of Tsuchiura, it is a much simpler, more rustic fireworks event that I have grown most fond of- the RYU-SUI MANDO HANABI held on the second Sunday of each September in the old hamlet of Hakke in Tsukuba. 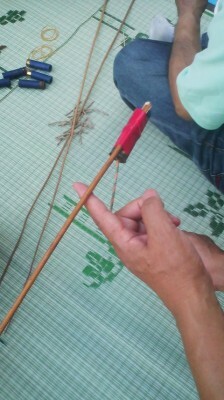 A throwback to another era when villagers MADE THEIR OWN FIREWORKS, the RYU-SUI HANABI are not overwhelmingly noisy or bright. The crowds are small and relaxed- and the RYU-SUI fireworks themselves, rockets made from plant stems, streak unsteadilly into the night- like crazed shooting stars- for about one hundred meters before they fade away. But what I find moving is that each shot is prepared with loving care by a villager whose father, grandfather and great-father before him, had sat in the very same spot, assembling the same type of rustic rockets which are launched as offerings and prayers by individual members of the community. And since all this happens on the grounds of an old Shingon Sect Buddhist Temple (which is of interest on any day of the year with its curious array of sacred stones), the magical night of the RYU-SUI MANDO HANABI is truly one to look forward to each year (for me, at least!). 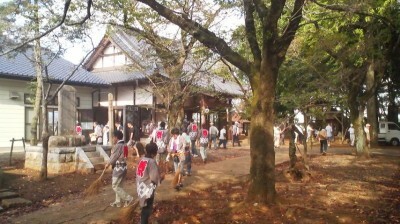 Traditionally held on the grounds of the Fukujusan Kannonji Temple ( usually referred to simply as Kannon-Ji), which was originally founded on its present site in 1542, most of the Ryu-sui Rocket fireworks are now actually fired from the vegetable fields between the temple and the nearby Kashima and Atago Shrines　( though 3 rockets are actually fired right in front of the temple`s main hall). A look at the name of the festival, and the rockets themselves- Ryu-sui (DRAGON WATER) – can give us a deeper understanding of what this event meant to past generations. 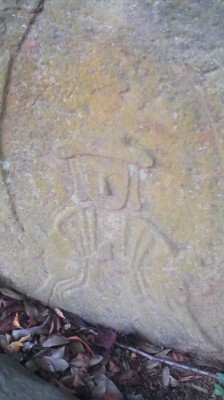 The characters for dragon (龍 or 竜) and water (水) used to write the name were traditionally written on the water pumps used by Japanese fire-fighters, as dragons have long been connected with both water and fire-prevention in Japan. This is perfectly appropriate since the event, and so much of the traditional concerns of the people of Hakke, are bound up in preventing fires. 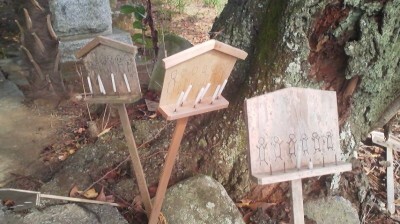 The nearby Atago Shrine, once actually a part of the temple, is dedicated to fire prevention, and as I have written about before, many residents of Hakke throw offerings onto their rooves each New Year to protect their homes from fire. The Fukujisan Temple itself, had in fact burned down twice in its history ( its present main hall having been built in 1986), with its old wooden image of the Amida Buddha being the only thing to survive the conflagrations. Because of this, belief in the powers of the statue (especially for fire prevention) grew passionate. The Ryusui Mando Sai Fireworks Festival had until recent years been held on the September 17th, which was the special day (en nichi) dedicated to Amida Buddha ( the date was changed to the second Sunday in September to make it more convenient for local residents who now mostly work regular jobs). Another story which helps explain the origins of the use of fireworks in the festival is something which apparently happened sometime during the mid-late Edo Period (which ended in 1868). As an epidemic raged in the area, someone dreamed of the Buddha Amida coming to them saying `let the scent of gunpowder waft into the air to me and the sickness will go away ‘. It was because of this 19th century vision that the men of Hakke have for generations been fashioning home-made rockets of plant stem and gunpowder and launching them into the September night. 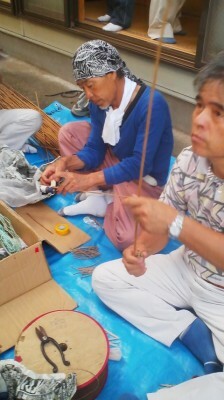 And it is because the fireworks were launched as religious offerings that the event has the word MANDO (万灯） in its name. 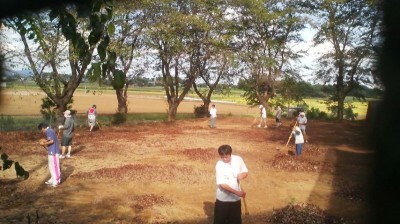 Mando festivals are those in which offerings of light are made to Buddhas or ancestral spirits. 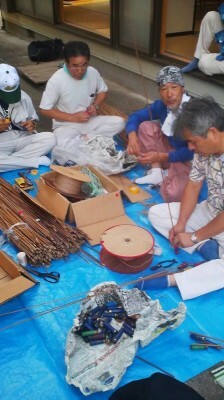 It should be remembered that traditionally in Japan, the launching of fireworks was often considered a religious act – even the great fireworks event in Tsuchiura was originally conceived as a way of consoling the spirits of the pilots who had lost their lives training over and on Lake Kasumigaura. Though the rockets have not changed much from their original form, they HAVE changed. 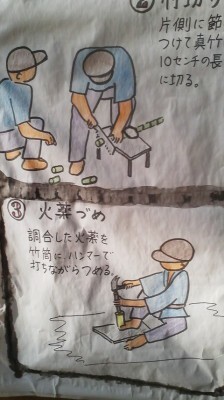 One reason for this is that Japanese law has changed. In the wake of the Aum Shinrikyo`s sarin attacks on the Tokyo subway, and even earlier in the city of Matsumoto, the Japanese police decided it was time to put tighter control on rockets and other vehicles which could deliver chemical agents over distances. The new regulations took away the people of Hakke`s right to make their own rockets. What they do now is have launchers made for them by a local licensed fireworks factory. Instead of the traditional bamboo launchers, the ones made for them now are slightly altered shotgun charges. 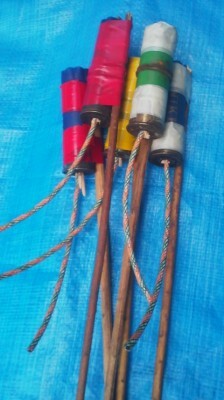 I sat with the men of Hakke as they bound these launchers to the long stems of a plant which they call BINBO GUSA. After doing so they carefully checked the stability of the rockets by balancing the stems on their fingers and making adjustments if the balance was off. In about one hour they made 160 rockets (that was the number of launchers they had ordered this year). And while the rockets were being made, a few hours before the event would begin, they was a lot of other activity in and around the temple. 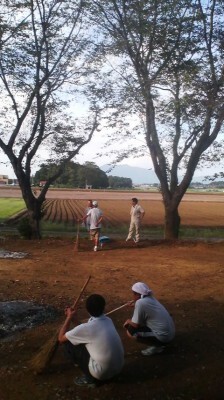 The grounds were being cleaned, leaves burned, stalls set up (shaved ice and yaki-soba noodles, etc.). Chatting with the men making the rockets I heard reminiscences of the old days- how the event used to be a competition betwenn 8 different neighborhoods vying to make the most impressive launches. They also remembered how when the temples roof was still made of thatch (before 1986) errant rockets would get the straw smoking- and the local fire brigade working fast to make sure an actuall fire did not break out. 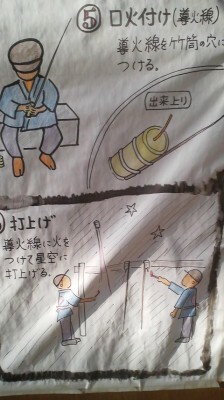 Now instead of being a competiton, each ryu-sui rocket is launched as an offering, a prayer. 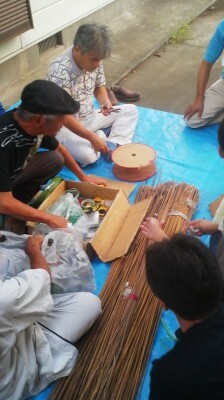 In addition to the home-made rockets, the professional fire-works factory is also called upon to launch blasts which are paid for by local residents. Before each launch, the name of the sponsor, as well as the type of wish being made ( family safety, health, success in business, good harvests etc.) is announced reminding me of the days of yore when patrons of tea shops along the Sumida River (in Edo and hen Tokyo) would pay money for a blast of fireworks to be launched). 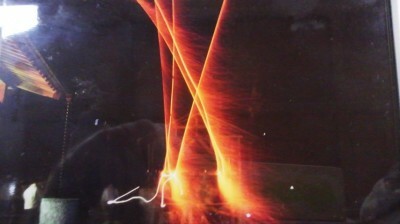 These days asking for a firework to be launched in your name can cost up to 30,000 Yen per blast. 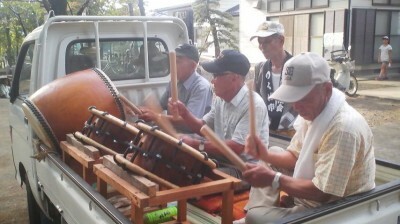 As the grounds got cleaner, all the rockets almost completed, and the festival stalls set up, a pick-up truck loaded with three taiko drums (and three old men to play them) set out to drive throught the town announcing that the festival was on. At five o`clock a party began for all those involved, and I headed on home to take a rest before the event began at 7:00. I arrived just in time to hear the traditional signal fireworks launched to mark the beginning of a festival ( as is the custom the same AIZU NO HANABI had been launched at 7 am on the same day as well. After a series of speeches and greetings ( which lasted about 30 minutes) it was time to launch some rockets. They were set up on a special frame and their fuses were lit. They took off in a flash and streaked sleekly in the night before disappearing. Asako Seo, born and raised in Hakke, told me how frightening these erratically flying rockets were in her childhood. I could see what she meant. There really is no way of telling which way these rustic rockets will fly. 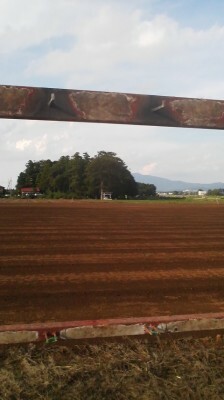 It was then time to have a seat, relax and enjoy the more than 150 ryu-sui rockets which remained to be fired. There were all the standard fireworks ( the ones paid for by those wanting to make a wish) to be launched as well. Not to noisy or bright, not crowded at all, and with perfect weather, I savored each burst and streak until 9:00 when the last one went steaking across the sky. A couple of beers which I had been given by hospitable locals made things look even better. But looking around and noticing how few children (or young people at all) were present, I realized sadly that despite the efforts of local residents as Makoto Sakairi, who have put so much effort into keeping the tradition going, this beautiful annual event might not have many more years left in its future. 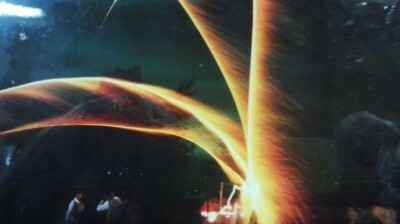 Like the ephemeral bursts of light which faded away in an instant as I watched, the Hakke Ryu-sui Mando Hanabi event, seems unfortunately destined in the next generation to fade out into the night of history. So next year come out and enjoy it while its still going relatively strong. Getting Ready For The Big One- The Great Ishioka Festival (Ishioka no Omatsuri, 石岡のおまつり) which will be held Saturday, Sunday and Monday Sept. 15 thru 17- and some pics of the event from last year!